The National Science Foundation and the journal Science recently ran a competition to produce the best scientific images. 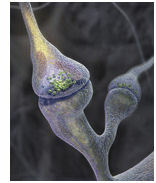 The winner in the illustration category was an image of a neuron, moments before it transmits a signal across the synapse. The full size version of the image is both strangely beautiful and visually stunning. Science also has a short article to accompany the image, that describes how it was created and the biological techniques it was based on. Link to Science and Engineering Visualization Challenge.